If you have set up galleries/venues and added art to your account, you are ready to begin creating consignments. Consignments allow you to record the movement of artwork from one location to another. You may do this by simply changing the location of a piece of artwork from your art list; however, creating a consignment will allow you to record the date of the location change. 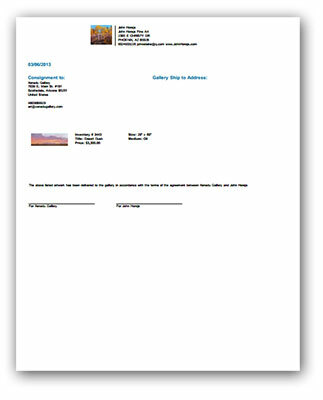 You may also print your consignments to provide your galleries a written receipt for the artwork. To create a consignment, you may either use the quick link on the left side of your screen, or click on the consignments block from your account command center. Select the gallery/venue where you would like to consign the art, and set the consignment date. Click the "Save and Proceed" button. 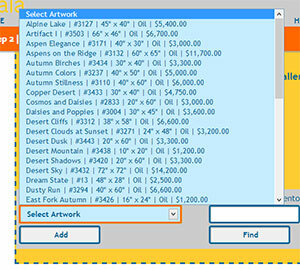 On the next screen, select the artwork you would like to consign from the "Select Artwork" drop-down menu. Once you have selected the artwork, click on the "add" button to add the artwork to this consignment. Alternately, if you know the inventory number of the artwork you would like to consign, you may type it into the "shortcut" box and click "find". This will highlight the art you are seeking in the "select artwork" drop-down, and you can then click "add". You may add as many pieces of art as you wish. When you are finished selecting art, you can print a copy of the consignment to provide your gallery. Print by clicking the "print this page" button (or by using the ctrl+p or command+p keyboard shortcut). 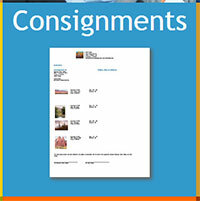 Your consignment will format for your printer and will include your contact information at the top, and a signature line for you and for the recipient. Once you have printed your consignment, click "save and proceed" to return to your account command center. Should you need to edit your consignment, click on the consignment block from your account command center, scroll down to the consignment you wish to edit, and click on the "edit" link.